Joey B And D-Black Deny Knowing Fameye. 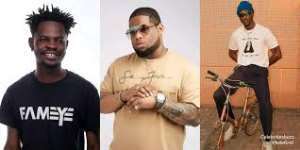 Tonga hitmaker Joey B and D-Black have denied having any alliance with fast-rising Ghanaian musician Fameye. Although Joey B admits he ‘adores’ Brukina, he posted on his Twitter page that he would never send a complete stranger, a clear indication he does not know who the said artiste is. Joey B was responding to a question by his former label boss Desmond Blackmore (D Black) who was also surprised when he came across the story.